ABUJA, Nigeria - A Nigerian airliner with 104 people on board slammed into the ground moments after takeoff on Sunday - the third deadly crash of a passenger plane in less than a year in this West African nation known for its notoriously unsafe air industry. Six people survived, and the rest were believed dead. Among those killed was the man regarded as the spiritual leader of Nigeria's Muslims, and thousands of people gathered at a regional airport to receive his body. 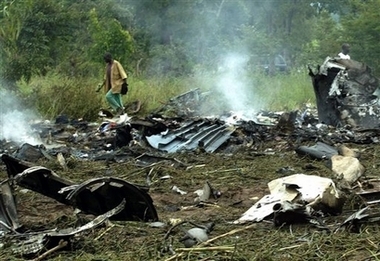 The Boeing 737 crashed one minute after taking off from Abuja airport, said Sam Adurogboye, an Aviation Ministry spokesman. President Olusegun Obasanjo ordered an immediate investigation into the cause of the crash, his spokeswoman Remi Oyo said. Rescue workers found debris from the smashed plane, body parts and luggage strewn over an area the size of a football field. The plane went down inside the sprawling airport compound about two miles from the runway. Smoke rose from the aircraft's mangled and smoldering fuselage. Its tail hung from a tree. Emergency workers pulled blackened corpses from the wreckage, then covered the bodies with white sheets and hauled them away in stretchers. An Associated Press reporter counted at least 50 cadavers, though other bodies had been transported earlier to local morgues. Through the day, airport security officials kept back anxious people seeking information about friends or loved ones. Adurogboye said 104 passengers and crew had been aboard the doomed flight, and he knew of six survivors who had been taken to a hospital. "Obviously the rest are feared dead," he said. 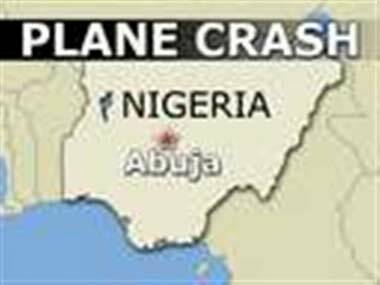 The plane was bound for the northwest city of Sokoto, about 500 miles northwest of Abuja, state radio said, adding that it had gone down during a storm. Witnesses said there was a rainstorm around the time the aircraft took off, but rains later subsided, giving way to overcast skies. In an announcement broadcast on state radio, the Sokoto state government announced the sultan of Sokoto, Muhammadu Maccido, died in the crash. Maccido headed the National Supreme Council for Islamic Affairs in Nigeria. The panel determines when Muslim fasts should begin and end, and decides policy for Nigeria's overwhelmingly Sunni Muslims. Maccido was immediately flown to Sokoto, where thousands of people were at the airport to receive his body. He was buried Sunday in accordance with Islamic custom, and the Sokoto state government declared six days of mourning. Mustapha Shehu, spokesman for the Sokoto state government, had said earlier that the sultan's son, Muhammed Maccido, a senator, also was aboard the flight, along with Abdulrahman Shehu Shagari, son of former Nigerian President Shehu Shagari, who was in office between 1979 and 1983. Their fates were not immediately known. About half of Nigeria's 130 million people are Muslims. The country is the most populous in Africa and the continent's leading oil exporter. Oyo said Obasanjo was "deeply and profoundly shocked and saddened ... he offers condolences to all Nigerians, especially family, friends and associates of those who may have been on board." The 23-year-old aircraft, a Boeing 737-2B7 owned by Aviation Development Co., a private Nigerian airline, was manufactured in 1983, Adurogboye said. ADC last suffered a crash in November 1996, when one of its jets plunged into a lagoon outside Nigeria's main city, Lagos, killing all 143 aboard. Last year, two planes flying domestic routes crashed within seven weeks of each other in Nigeria, killing 224 people. On Oct. 22, 2005, a Boeing 737-200 belonging to Bellview airlines crashed soon after takeoff from the country's main city of Lagos, killing all 117 people aboard. On Dec. 10, a McDonnell Douglas DC-9 plane operated by Sosoliso Airlines crashed while approaching the oil city of Port Harcourt, killing 107 people, most of them schoolchildren going home for Christmas. Earlier this month, authorities released a report blaming the Sosoliso crash on bad weather and pilot error. The investigation of the Bellview crash is still continuing. After last year's air crashes, Obasanjo vowed to overhaul Nigeria's airline industry, blaming some of the industry's problems on corruption. Airlines were subjected to checks for air-worthiness and some planes considered unworthy were grounded.